Dammit, you beat me to it! My breakouts should ship tomorrow and be in hand by the weekend, at which point I’ll write some more. For now, working on odds and ends from the rest of the projects on my list. Now, following the trend… first one to build a breakout for the iPhone Retina display wins the big prize. That one’ll be much more interesting – first it is required to convert the source to MIPI DSI. To my knowledge no silicon exists to convert TO DSI (although DSI->x is plentiful). How you plan to manage the initialization sequence? MIPI DSI is not just data and there is no standard negotiation like the one in DP using DPCD. Oh… so Toshiba makes a whole line of stuff, including RGB->MIPI DSI (TC358768A). I hadn’t looked into it that hard before. Of course, I can’t get ahold of that, so it’s a moot point. Did you build up the unit yourself, or purchase it from a third party? I was not aware of that Toshiba chip, back then they were offering only CSI bridges. 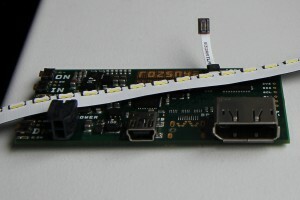 The SSD2828 has 4 data lanes, so it can drive a FullHD mobile phone LCD, which is one of my projects. The chip comes in QFN (the Toshiba is ultra fine pitch BGA). There are some evaluation modules (made in china) but I rather designed my own board – in the same way as other modules are done: RGB input on one B2B plug and MIPI output on the other B2B. That output would then attach do a display specific breakout board, which holds the multiple power supplies required by the LCD itself. So far all the modules are very specific and different, but maybe one day I standardize the interfaces for similar function, so they would be easily exchangeable – that would lead to a great development system and others could build their own modules or application specific assemblies. Is there a distributor that sells Solomon parts in small quantities? I’m sure I don’t have the buying power in my hobbyist activities to interest Solomon in selling to me. Hi Mike. I’m in desperate need of some advice. I bought a 15″ Mac Pro retina (damaged by liquid). It powered on, but the display didnt light up. I disassembled it, and found that the backlight fuse on the logic board was open. I inspected the ipex connector, and found that pins 1 and 2 was melted away. I followed the track off pin 1 to a capacitor. I cut the coax wire on the cable from pin 1, soldered it to the capacitor on the logic board. I replaced the fuse. The display lights up exactly like on your pic (only one led array). Pin 2 is allso fried and not bridged. Acording to your pinouts I see that pin 2 is not connected). Why do I only get one led array active? Hmm, how odd. 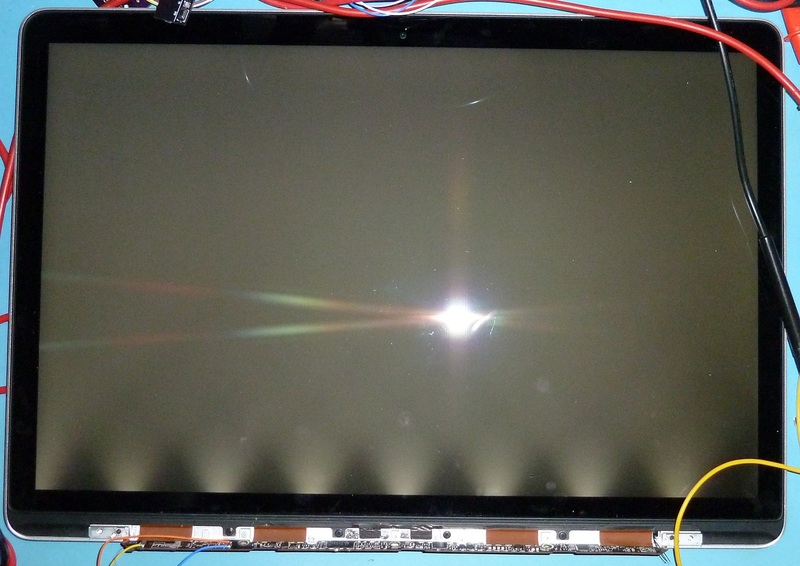 Well, the very first thing I’d do is check continuity between the I-PEX and the backlight connector to the left of it, to make sure no additional traces were damaged. If one channel works it means the common anode is working, so that’s a good start. If you’ve got a proper current-limited bench supply and a steady hand, you could also try applying a DC voltage (~45-48V) directly to the connector to determine whether the backlight strings themselves are all still alive. It could also very well be damage to the logic board, possibly destroyed transistors near or in the backlight driver. I’m not familiar with the logic board construction, though, so that’s about all I can offer you in that area. Thanks for your reply. Am I understanding correct that the problem might be a broken track on the pcb between led k1 and led k6?, or should I look at pins vcc (28-30)? That thin coax wires are a mission to solder.